Akal Academy, Baru Sahib was established in 1986. Where is the exact location of Akal Academy Baru Sahib? Akal Academy, Baru Sahib is located about 60 to 65 Kms from Solan towards Rajgarh in the state of Himachal Pradesh. How one can reach Baru Sahib? 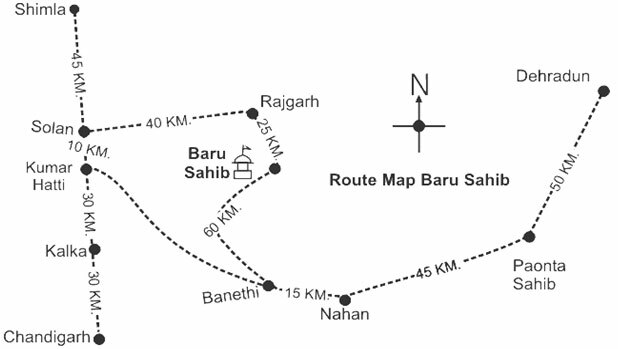 Baru Sahib can be reached by Solan, Rajgarh route .The approximate distance of Baru Sahib from Solan is about 60 to 65 Kms. The nearest Airport to Baru Sahib is Jubarrhatti, Shimla. What are the possible routes to reach? From Solan to Rajgarh, the frequency of bus is 30 minutes. What are the climatic conditions at Baru Sahib? The spring season starts from mid February to mid April. The weather is pleasant and comfortable all over the season. Starting October to December, morning and night are quite cold. Admissions in Akal Academy, Baru Sahib are made on merit basis and are open to all students, irrespective of caste, creed or religion. Children above 4 and below 5 years as on 1 March of the admission year are admitted to the Nursery class without any entrance test. Interview of the child and parents/guardians is conducted on the same day after the child takes the entrance test. The main objective of the interview is to assess child’s personality and problem areas so as to identify children who need special attention. What are the grades up to which admissions can be sought? We admit the children between 4 to 12 years of age in different grades. Class Nursery is the entry level for the school admission and admissions are generally offered till Class IX and in some special cases in Class XI (Girls only) depending on the number of vacant seats. (Admissions in Class X and XII are not accepted). How is the Primary Years Programme different from other elementary School programmes? The Primary Years Programme (PYP) provides an educational framework based upon what is currently known how young children learn. It draws on the best practices in elementary school instruction. The PYP requires all teachers in the school to plan units of instruction and lessons collaboratively around six important themes. The collaboration facilities a carefully thought-out and sequential development of skills, knowledge and attitudes, while the organizing themes provide both students and teachers a rich and inviting learning environment in which they can explore. In brief, the six organizing themes are: Who are we; Where we are we in place and time; How we express ourselves; How the world works; How we organize ourselves; and How we share the planet? In the PYP, students are taught to understand that learning is about asking question and looking for answers, which in turn may generate new, and perhaps more complex questions in need of answers. As teacher’s works with students through this programme of guided inquiry, they also help students understand what their relationship and responsibility is towards what they are learning. In the PYP character-building shares a prominent place alongside learning. Can Students transfer easily from one Primary Years Programme school to another? Keeping in mind that each school determines its own admission and placement standards, the essential elements of the PYP will be the same from school to school. However, since the IB does not prescribe the curriculum to be taught, that may vary from school to school. This should not create a problem, however, because students are studying an approach to learning. Do primary Years Programme students have to take IB examination? There is no IB Examination in the PYP. All student assessment is organized and conducted by the teachers in the school. How can my child enroll in the Primary Years Programme? Only those students enrolled in and attending IB-authorized schools are permitted to participate in the PYP. Are all children in my school required to participate the Primary Years Programme? Yes. The PYP is intended for all children ages 3-12 in the school, regardless of their learning needs. Can students with special needs participate in the Primary Years Programme? Yes. IB-authorized schools are expected to involve all of their students in the PYP, regardless of their learning needs. The IB refers to this as a “whole school approach.” The IB expects that schools will make any necessary accommodations for students with special needs. Is departmentalized instruction allowed in the PYP? Ability grouping across as entire grade level where students receive instruction in mathematics, language(s) of instruction, science and social studies from someone other than their classroom teachers, the teacher with whom they spend the most time. Team teaching that results in students receiving instruction in mathematics, languages(s) of instruction, science and social studies from someone who is not their classroom teacher. Any scheduling configuration or plan in which students receive instruction in mathematics, language(s) of instruction, science and social studies from someone other than their classroom teacher, the teacher with whom they spend the most time. The practice of supporting students with literacy/ math needs is acceptable as the goal of this model is to bring students up to grade level so that they may eventually be integrated in the classroom. This practice would not be in violation of the policy as many of students who receive special education support are legally obligated to receive instruction from the learning disability resource teacher.